Why They Can Be A Healthier Choice Date fruits from date palms are one of the oldest cultivated food crops, dating back to ancient Egypt, Mesopotamia and the Indus Valley, regions historically referred to as the "early cradles of civilization". One of the rare "fruits of the desert", date palms are a symbolic icon of paradise or the "Garden of Eden", representing growth, vitality and abundance. 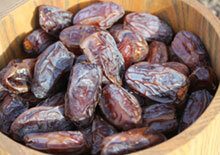 Dates are also hardened, usually via dehydration methods, ground and sold as a "date sugar" available as a natural sugar substitute for use in various foods and drinks.